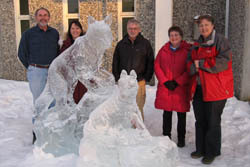 Alaska Unit staff consists of a Unit Leader, three Assistant Leaders, a Fiscal Officer, and an Administrative Assistant. Unit scientists hold positions as research faculty with the Institute of Arctic Biology, University of Alaska Fairbanks, and have teaching appointments with the Department of Biology and Wildlife or the School of Fisheries and Ocean Sciences. The Alaska Unit is housed in the Laurence Irving Building on the West Ridge of the University of Alaska campus in Fairbanks, Alaska.